Guide Ray Hanselman holds a 10.13-pound Amistad hog for a client. The fish was caught on a Reaction Innovations Sweet Beaver while flipping the hydrilla in late July. Ever dream of a 30-pound limit of bucketmouths? Yeah, we all have – and then we woke up. But what if there was a real lake where the possibility of a 30-plus-pound limit of fish wasn’t just a dream, but a distinct possibility. We know, you're thinking there isn’t such a place, and even if there was, only guides and pros can catch them like that. Well, what if we told you it’s not a dream, and it’s not just a lake where the guides and the pros can do it. It’s western Texas’ Lake Amistad. And the best thing about Amistad is the pigs are at the trough all year long. Texans have known all along how good this fish factory is, but the rest of the world had little clue until the Stren Series and Bassmaster Elite Series ventured there in the spring of 2006. Now the lake is getting its share of acclaim around the U.S., but many anglers think “it’s only a spring bite." How wrong they are. Here are some examples from veteran Amistad guides Travis Darley and Ray Hanselman. For this installment of the Hot Zone, we talked with Hanselman and Darley to get an idea of just how good the bite is, and what anglers can do to increase their odds of catching that 30-pound limit of fish. Lake Amistad offers the angler probably more opportunities to catch big fish than any other lake in the country, due to the fact that fish can be caught all year long on more than one technique. So whether you like to throw jigs, topwaters, creature baits or whatever, you’re never out of your comfort zone. The topwater action has changed in the last couple of days too. Both guides agree that the consistently bigger fish are always on the deep grass bite. “The hydrilla grows down to 30 feet and has a canopy at the top,” Darley said. “In this deep of water, the weeds don’t reach the surface, and if you have your electronics set properly, you can actually see the fish below the canopy. Hanselman said he and Darley rely on jigs made by Terry Oldham. Darley agreed with Hanselman, but added this: “Look on the main-lake points and submerged humps until you find the edges of the hydrilla that are in 23 to 35 feet of water. Then look for dips, cuts and points in the grass. If you see bait and fish, you’re in the right area. “The key is to stay on the edges. You’ll need to cover a lot of water to find the fish, but once you find them, you can catch a number of fish in one small area fast. The angler needs to work from the bottom of the canopy all the way to the bottom (of the lake). Sometimes the fish will eat it on the fall, on the bottom or on the way back up." The heavy dropshot is also a killer. Drift-fishing deep grass flats on Aug. 7 resulted in these two fine fish for Danny Kay and Mike Bradley. They were caught on Reaction Innovations Skinny Dippers in the California 420 color. “Dropshotting has been great recently. In fact, the dropshot bite in the deep grass is averaging 6 1/2-pound fish right now. I’m fishing a 3/8-ounce dropshot sinker with a 4-inch Zoom Finesse worm in watermelon/red-flake or watermelon/gold-flake." Hanselman said heavy Texas rigs are also productive. 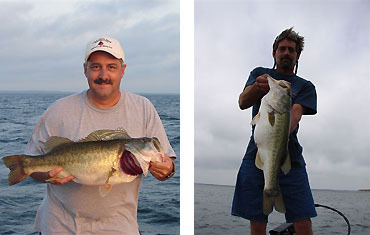 Both guides are also drifting lighter Texas-rigged baits on the top of the deep weeds. Darley added that his best baits have been the 6- and 7-inch YUM Dingers in either junebug or watermelon/red colors. Again, he’s using a 3/16-ounce Tru-Tungsten Worm weight. Heavy grass requires heavy tackle, and Darley and Hanselman offer some tips on just how heavy your tackle should be. Both anglers go a little lighter for the dropshot technique. “I’m using a 7-foot Waterloo Mag Four rod with 30-pound Sufix braid with a 6-foot, 16-pound-test Gamma (Edge) fluorocarbon leader,” Darley said. For the drift-fishing bite, both are using medium-heavy rods with straight 16-pound Gamma Edge fluorocarbon line. Frog gear to use is typical heavy-power rods with 65-pound braided line. 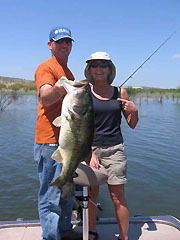 > To reach Darley at Border Bass Guide Service, call (830) 775-0277 or (830) 703-0414, or send an email to tdarley@stx.rr.com. To reach Hanselman at Reel-n-Ray Guide Service, call (830) 774-1857 or (830) 317-9942, or email reelnray@hotmail.com. > Lake Amistad is located in western Texas on the U.S./Mexico border. Anglers fishing the Mexico side of the lake must have both a Mexican fishing license and a Mexican boat permit. Both can be purchased at Amistad Marine in Del Rio, Texas. Phone: (830) 775-0878. > The deep-grass and topwater bites will continue throughout the next couple of months, but the jerkbait and crankbait bites will begin within that time. > Local angler Tim Reneau fished a three-bass tournament on July 29 and weighed in a winning limit of over 19 pounds. > To suggest a Hot Zone lake in your area, click here.